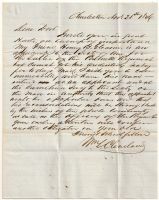 Description: Stampless folded 2 page letter posmtarked red CHARNS, S.C., MAR 4 with matching FREE rate sent to Colonel Roger Jones, Washington. Description: H. E. O'HAGAN & CO. fish illustrated advertising on US 3 cent green entire postmarked SANDUSKY, O., SEP 1, 7 PM sent to Townsend, Mass. Description: CSA #11 on turned cover postmarked KINGSTON, GA., SEP 16 sent to Pinckneyville, Georgia. Inside addressed with stamps removed. Description: CSA #12 on cover postmarked MACON, GA., sent to Milledgeville, Geo. Description: CSA #11 on cover postmarked THOMASVILLE, N.C., SEP sent to Greensboro, NC. Description: CSA #11 on cover postmarked COLUMBUS, Ga., AUG 9 sent to Gainesville, Georgia. Description: CSA #7 pair on cover postmarked CHARLESTON, S.C., DEC 27, 1863 sent to Griffin, Georgia. Description: CSA #11 on cover postmarked RICHMOND, Va., JUL 30 sent to Capt. (ain) Stephen Terry, Berea, NC. Description: CSA #12 on cover postmarked reddish-brown OPELIKA, ALA., sent to Columbus, Georgia. Description: CSA #7 pair on cover postmarked blue COLUMBIA, S.C., DEC 26 sent to Capt. (ain) Thomas Nesbitt, Newton, Georgia. Description: CSA #11 on cover postmarked LAGRANGE, GA., MAR 27 sent to Athens, Georgia. Description: CSA stampless cover postmarked LIBERTY HILL, S.C., AUG 5 with manuscript P(aid) - 5 rate sent to Flat Rock, North Carolina. Description: CSA stampless cover postmarked GEORGETOWN, S.C., SEP 23, 1861 with matching PAID 5 in circle sent to Flat Rock, North Carolina. Description: CSA #12 on cover postmarked FORSYTH, GEO., JUL 21 sent to Griffin, Ga. Description: CSA stampless cover postmarked blue NORFOLK, VA., SEP 18, 1861 with matchingÂ PAID in circle and "10" sent to Griffin, Ga. Description: CSA stampless cover from Cpl. T.W.G Inglet, Co. C, 28th Reg't GA Vols., postmarked LAKE CITY, FLA., FEB 25 sent to Berzelia, Georgia. Description: #332, Tied by Boston flag cancel on US Cartridges advertising cover, Very Fine. Description: #26, Tied on Patriotic Cover, Nice design, Very Fine. Description: US Scott 30a pays half the rate to Nova Scotia on folded letter from New York. Blurred Halifax back-stamps on reverse. Description: US Scott 32 pays the 10 cent rate on letter from Ohio to California. Description: Stampless folded letter sent from "United States Military Store" postmarked red CHALSN, S.C., AUG 23 with matching FREE sent to Phila. Description: US #24 on printed BANK OF THE REPUBLIC circular postmarked BOSTON, Ms., NOV 1, 1860, PAID sent to Wareham, Mass. Description: US Scott 64 franks letter at standard rate from RI to NY. Description: US 3 cent red U10 entire postmarked with rimless INDIANAPOLIS, IND., DEC 27 sent to Hallowell, Maine. Original 4 page letter accompanies cover. Description: Stampless folded letter sent from "New York" handstamped red STEAMER 5 in oval sent to Providence, RI. Description: CSA stampless cover postmarked FAIRFIELD, Va., NOV 21 with matching PAID and manuscript "10" rate sent to Staunton, Va.